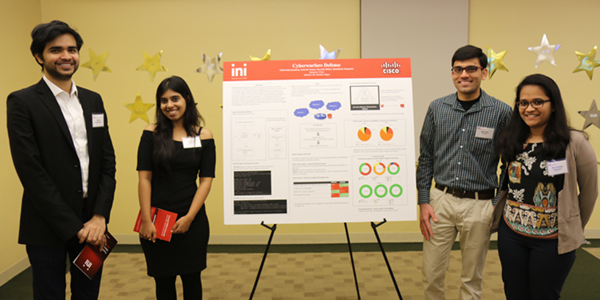 Last fall, teams of Information Networking Institute (INI) bicoastal mobility and information security students collaborated with companies in Silicon Valley to solve complex problems. In the practicum project, these students developed apps powered by blockchain, researched the security of enterprise routers, created airport simulation tools, analyzed electric vehicle and smart home energy data, and much more. “From a sponsor's perspective, the value of the practicum is influence. 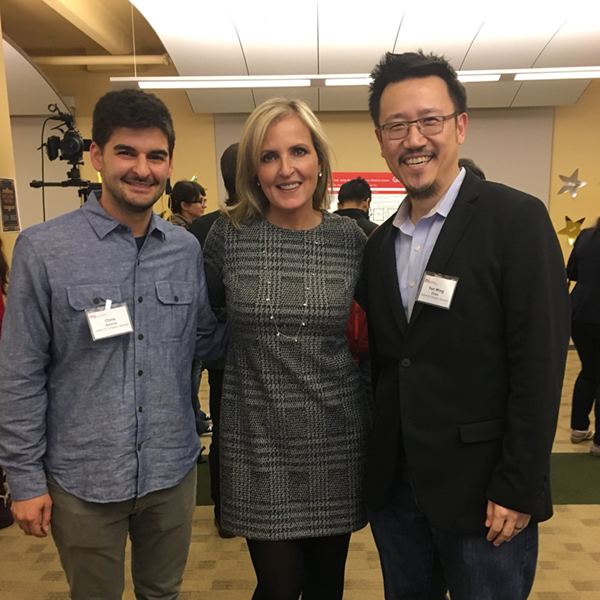 Sharing the Cisco brand and culture, inspiring the next generation, giving back - all while improving our recruiting pipeline,” said Chris Dorros, a 2012 alumnus of the bicoastal information security program. INI director Dena Haritos Tsamitis with practicum alumni sponsors Chris Dorros (left) and Yen-Ming Chen (right). Dorros was one of three INI alumni who sponsored projects in 2017. For Leo Boulton (MS16), the practicum was a means to obtain outside-in perspective, in an unbiased way, to a challenging problem at Cisco. “INI students are brilliant, and always looking to think outside the box, without an ‘it-can't-be-done’ mentality,” he said. 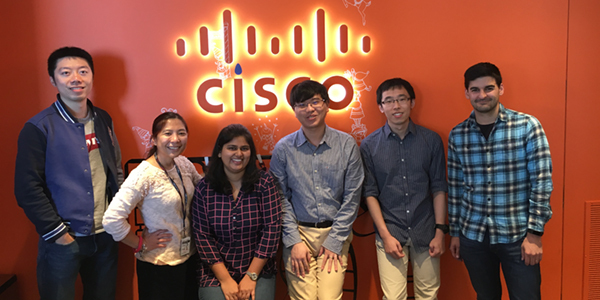 INI student Nitish Balachandran (MS28) said the best part about working with Cisco was getting an inside look at what Cisco does to stay ahead of the curve in router security. “I don't think that you can get such industry-specific insight from a conventional academic setting, so it's great that the practicum afforded us this opportunity. Working with an INI alumnus is great because we were always well taken care of,” he said. 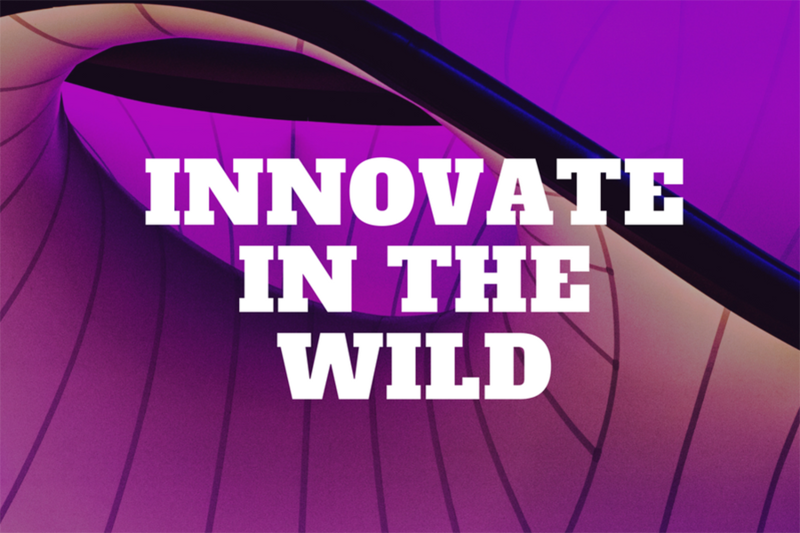 Other student teams gained exposure to a whole new set of technologies. 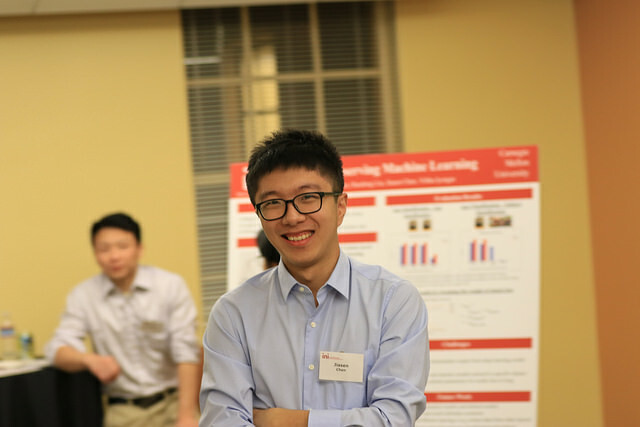 Working alongside alumnus Yen-Ming Chen (MS10), Team Quin built a mobile app powered by a blockchain technology that allows the user to create, connect and manage online and real-world trust relationships. “I hope they experienced the whole process from ideation to fruition, and are able to apply that in the future. Because that was exactly my goal, to bring together a team to actualize an idea to a proof-of-concept," said Chen. INI students showcased their practicum projects to industry, government and research sponsors on December 7, 2017. Chris Dorros went from student to sponsor in just five years. Today, he is a manager of security engineering at Cisco Cloud Security. The project compared the integrity and trustworthiness of two enterprise routers, resulting in a comprehensive report detailing the team's analysis. Beyond the benefit to the sponsor, Leo Boulton says he hopes his team enjoyed being exposed to a real-world business problem. "Sometimes students think that solving the task at hand is all that is needed; we hope our students also saw why was Cisco interested in solving that problem, what was the applicability to the real business world, and how Cisco will use their results," said Boulton. 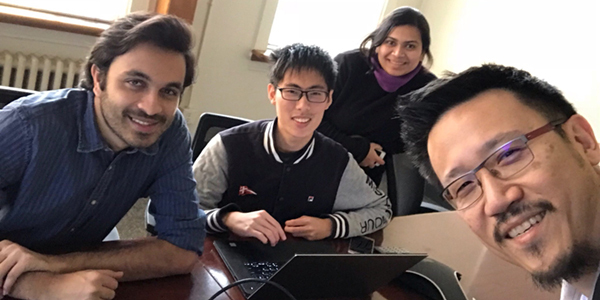 This team actualized an idea to proof-of-concept for a trust management platform powered by blockchain. In the process, students learned about distributed ledger technologies, Ethereum, identity management, smart contracts, existing online trust ecosystems, user privacy and much more. "They completed the proof-of-concept to validate the idea, added features and resolved issues along the way. That's tremendous help for me to take the next step for my work. We were also able to come up with new and revised idea to make it better while figuring out the roadmap for the future," said Yen-Ming Chen.